Whitefish, MT – Skiers and riders will find four new runs on the north side of the ski area and more elbow room in the base lodge at Montana’s Whitefish Mountain Resort this winter. 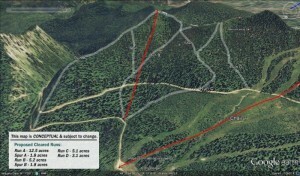 The new intermediate runs and a new liftline were cut this fall and will be accessible from the Big Foot T-Bar and are the first phase of the two-year Flower Point project. In the base area, the 1,200-foot addition to the base lodge will provide roughly 100 seats and a warm space for guests to view the beginner learning area. After completion, the Flower Point project will add approximately 200 acres of lift-served terrain including 32 acres of cleared runs and additional gladed areas. 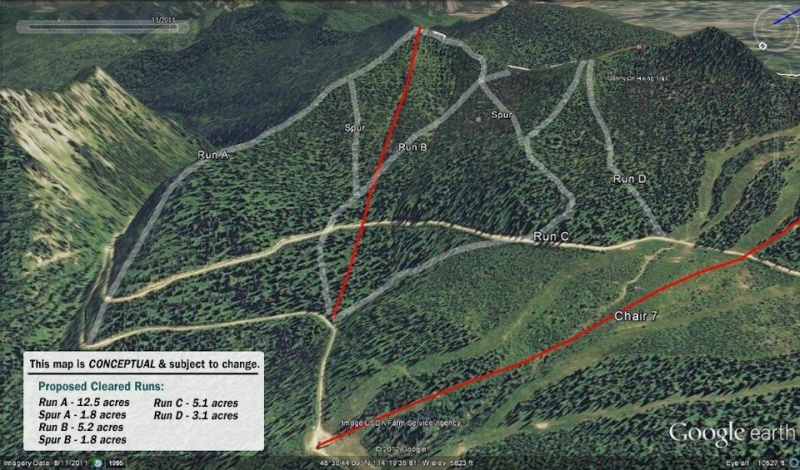 Three more runs and a fixed-grip triple chairlift with 970-feet of vertical purchased from Kimberley Ski Resort in British Columbia will be added in the 2014-15 ski season, providing an upgill capacity of 1,800 people per hour. The second phase will begin summer 2014 when the Flower Point lift is installed including 17 towers and 157 chairs. The Flower Point Chair is planned to run daily. Crews thus far have finished cutting the lift line and four new groomable runs and two connector trails in the Flower Point area. Timber will be removed, concrete has been poured for the new lift’s bottom and top terminals, and if weather cooperates they’ll also pour concrete for a couple of lift tower pads. The 1,200 square feet of new space in the base lodge will not only provide additional seats for guests to enjoy lunch and a warm spot to view the beginner area, the room also can be used for special events. Adjacent to the existing Mt. Jackson Room, the new room has been dubbed “The Gunsight Room” named for Gunsight Mountain which is next to Mt. Jackson in Glacier National Park. Each room can be rented out individually or together as one space. The resort plans to make additional changes in the base lodge to optimize capacity in 2014. Also new for winter 2013-14, Whitefish Mountain Resort’s Snowsports School will provide snowboarding lessons for 3-6 year-olds. Previously snowboarding lessons began at age seven, however with recent advancements in snowboarding equipment for smaller kids and an increase in the number of young customers whose parents in many cases are snowboarders, these lessons offer families the option of learning the sport of snowboarding at a younger age. In addition to the lessons, Whitefish Mountain Resort has added smaller snowboards and snowboard boots to its inventory. Whitefish Mountain Resort is scheduled to open for the 2013-14 winter season on Saturday, December 7th.